Adding chocolate to a pie and a quick bread casts this seasonal staple in a new light. Pumpkin mousse pie with double-chocolate crust. Pumpkins are better suited to jack-o’-lantern duty than to dessert duty, in my opinion. Despite my formidable sweet tooth, at Thanksgiving I’ll always go for a second helping of stuffing with gravy over a slice of pumpkin pie. As with many things in life, however, adding some chocolate improves matters dramatically. A chocolate-lined crust casts a new light on a lush pumpkin mousse pie, while a dose of chocolate chips elevates a moist, hearty pumpkin loaf. Use this mixture in the pie and the loaf. 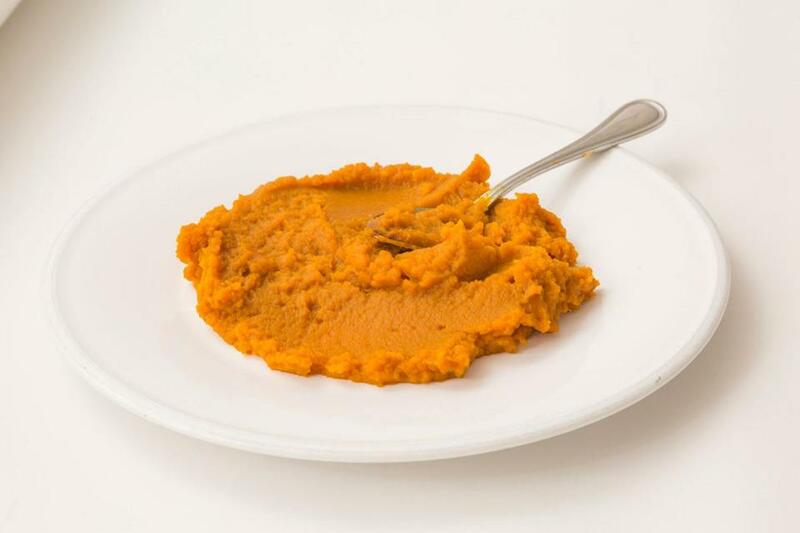 Be certain to choose plain pumpkin puree rather than pumpkin pie filling. In a medium nonstick skillet over medium heat, cook the pumpkin, constantly stirring and scraping the bottom of the pan with a heatproof flexible spatula, until thickened and darker, about 10 to 12 minutes (you should have about 1 generous cup). Add the cinnamon, allspice, nutmeg, and ¼ teaspoon salt and stir to incorporate. Spread the mixture on a plate and cool to room temperature, about 20 minutes, then proceed with the pie or loaf recipe. Remove the doctored canned pumpkin puree from the hot skillet and spread it on a plate to dissipate heat. Some cooking notes: 1) you’ll need an instant-read thermometer to take the temperature of the egg yolk mixture; 2) keep in mind that the pie has to chill and set for at least 4 hours before serving, and 3) you’ll have to whip the ¾ cup cream for the topping shortly before serving the pie. A light dusting of cocoa powder or a sprinkle of shaved chocolate would be a nice decoration. Adding ¼ to ½ teaspoon cayenne pepper in place of the allspice in the pumpkin mixture gives the filling a subtle, spicy kick. With the rack in the middle position, heat the oven to 350 degrees. Generously grease a 9-inch pie plate with 2 teaspoons softened butter and set aside. In a food processor, process the cookies to fine crumbs, about 15 seconds (you should have about 2 cups). Add the brown sugar and a pinch of salt and pulse to combine. With the motor running, slowly add the melted butter and process until the texture resembles wet sand, about 20 seconds. Pour the mixture into the pie plate and press into an even, compact layer across the bottom and up the sides. Bake for 12 minutes and cool completely on a wire rack (the crust will firm up as it cools). Scrape the melted chocolate into the cooled crust, spread it into a thin layer across the bottom and up the sides, and set aside until the chocolate hardens, at least 30 minutes. With a hand-held or standing mixer, whip ½ cup cream until it holds firm peaks, about 1 minute; scrape the whipped cream into a separate bowl and set aside to use in the filling. Sprinkle the gelatin over the orange juice, stir, and set aside until gelatin softens, about 5 minutes. In a double boiler or a medium heatproof bowl set over a saucepan with 1 inch of barely simmering water over low heat (the bottom of the boiler insert or bowl should not touch the water), heat the egg yolks and brown sugar, whisking constantly, until the mixture registers 160 degrees on an instant-read thermometer, about 5 minutes. Add the gelatin mixture and whisk to incorporate. In the now-empty mixer bowl, beat the egg yolk mixture at medium-high speed until thick and cooled, about 4 to 5 minutes, stopping to scrape down the bowl as necessary. Add the Doctored Canned Pumpkin Puree and vanilla and continue beating until uniform, stopping to scrape down the bowl. Add about ¼ of the whipped cream reserved for the filling and whisk to incorporate. Add the remainder of that whipped cream and, with a flexible spatula, fold until the mixture is uniform, with no streaks remaining. Scrape the mixture into the prepared pie shell, gently smooth the top, cover loosely with plastic wrap, and refrigerate until pie is well chilled and filling is firm, at least 4 and up to 24 hours. 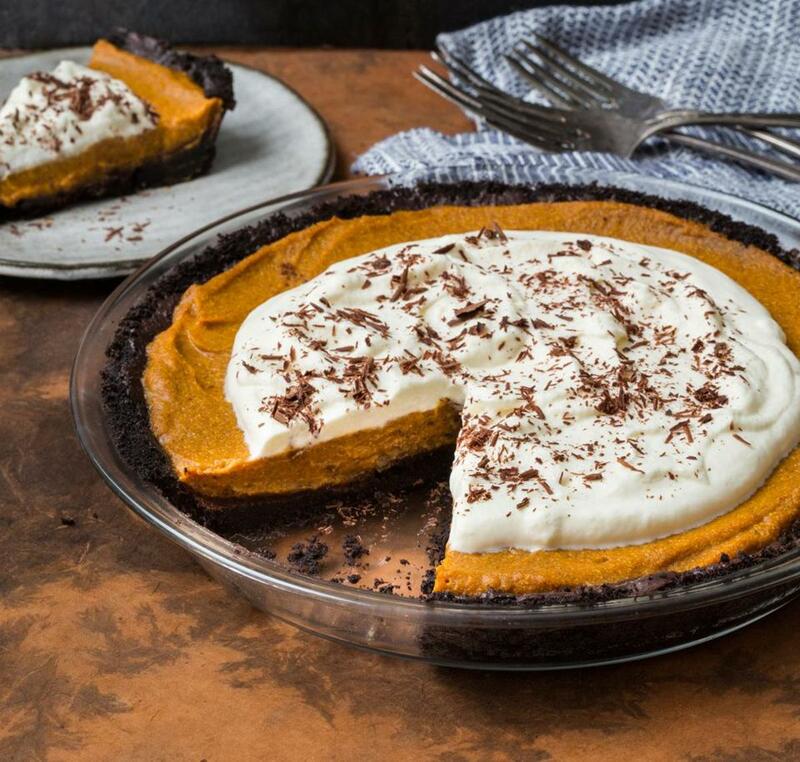 Near serving time, spread the whipped cream for the topping on the pie, leaving a small ring of pumpkin filling visible around the edge, decorate as desired, and serve. The flavor and texture of this loaf improves overnight, so make it a day ahead if your schedule allows. For an extra dimension of flavor, I sometimes substitute dried cranberries for half of the chocolate chips. To soften the cranberries a bit without introducing extra moisture, I add them to the skillet while making the Doctored Canned Pumpkin Puree, about halfway through the cooking time. With the rack in the middle position, heat the oven to 350 degrees. Spray a 9-by-5-inch nonstick loaf pan with nonstick baking spray (or butter and flour the pan) and set aside. In a medium bowl, whisk the flour, baking powder, baking soda, and ¾ teaspoon salt to combine. In a large bowl, whisk the eggs and granulated and brown sugars into a uniform slurry. Add the melted butter and whisk to thoroughly combine. Add the Doctored Canned Pumpkin Puree, buttermilk, and vanilla and whisk to combine. Add the dry mixture and, using a flexible spatula, fold and stir until the wet and dry ingredients are just incorporated (do not overmix), adding the chocolate chips partway through. Scrape the batter into the prepared pan, smooth the top, and bake until the edges pull away from the pan and a toothpick inserted into the center of the loaf comes out clean, 65 to 70 minutes, rotating the pan halfway through the baking time. Place the pan on a wire rack and cool for about 15 minutes. Remove the loaf, place it right side up onto the rack, cool to room temperature, and serve (or wrap well and rest overnight before serving). Adam Ried appears regularly on America’s Test Kitchen. Send comments to cooking@globe.com.